Alexander Ananoff was a person who lived his passion, the space exploration, and he dedicated to it a large part of his life. This untiring self-taught man made it possible for the people to discover, since the 30′s, the advantages of space exploration for mankind. By virtue of his popularizer talent he succeeded to pass down his passion throughout conferences, symposiums, and publications, where many of his contemporary looked at him with contempt. Thus, amongst other things, he helped Hergé for the redaction of the Tintin’s adventures on the Moon and he created the first International Astronautical Congress in 1950. Alexandre Ananoff, l’Astronaute méconnu (Alexander Ananoff, the unknown Astronaut) written by Pierre-François Mouriaux and Philippe Varnoteaux is an exciting biography which enlighten us on the not well known life of the first French space exploration popularizer. Posted on: 2013-04-23 under Non classé. From 20 to 26 June at Le Bourget airport stand the international air show of Le Bourget. I went there the whole tuesday and was mainly interested by the space stands. Unfortunately this edition doesn’t excel in the space domain. Indeed, the NASA has no stand, the JAXA (Japan space agency) shows only it’s supersonic jet, the ESA shows us some Europe pictures made from SPOT, and the Russian stand of ROSCOSMOS went with their regular mock-ups. The ESA presents us some informations about the capsule iXV (Intermediate eXperimental Vehicle) which seems to be a new test bench for manned or unmanned (cargo) spacecraft. On the Russian stand only a mock-up of the new capsule ACTS (developped by RKK Energia) to replace the Soyuz spacecraft is the only news. But this project is in it’s conception phase and computer simulation, it was difficult to know more, and what is its position in comparison of the Soyuz, what launcher will be used, a Soyuz, a Zenit? About the air show the troubles of Airbus vitiated the European demonstration. The A380 without its wingtip couldn’t flight and the engines of the A400M allows him only to do « normal » passes. At last, the now usual, absence of Russian fighters hedged the air demonstrations. But some planes on the ground need to be seen, like the C-5 Galaxy, the A-300 Zero G or the solar plane « Solar Impulse ». The lack of real novelty in the space those past times perfectly reflected in this edition, but the presence of some European astronauts at the ESA/CNES stands allow, to the space exploration enthusiasts, to be comforted. Posted on: 2011-06-22 under Non classé. 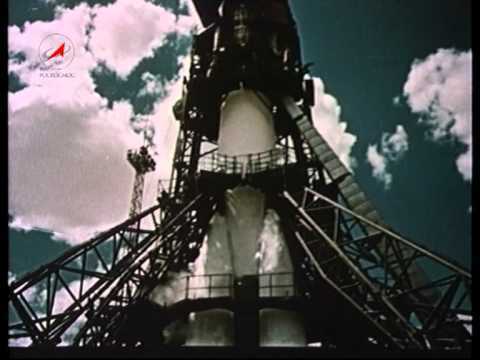 50 years ago day to day at 09h07 the Vostok rocket brought on board the first space traveler, Yuri Alekseyevich Gagarin. His flight was short (one orbit of 108 minutes), indeed nobody knew at that time how the human body will act in weightlesness, is it possible to breath, is it possible to drink… This is why the flight was to be the shortest possible. The Gagarin’s mission was to be the first to go to the unknown and simply see if men could live in weightlesness, thus, his first words were « I’m feeling ok ! ». At the end of his orbit the Vostok spacecraft automatically began its descent in the atmosphere, then the ejection system of his seat trigerred at 7000m height and Gagarin was catapulted outside his spacecraft to land under his parachute. The people of the Saratov village near by were first scared by the man in spacesuit (they first saw he was an American pilot shoot down by the defence) then they come in mass to welcome the man coming from nowhere. During years the Soviet authorities kept secret the fact that Gagarin, and all the cosmonauts of the Vostok program, were ejected of the spacecraft because it didn’t have a soft landing system, but for a record to be ratified the pilot must land within his spacecraft. But the facts are there, Gagarin was the first man to orbit Earth. Those 108 minutes of flight made Gagarin a national Hero and a Hero of mankind. The space travels were too dangerous at that time and the authorities forbidden him to flight again, it was also forbidden for him to pilot a plane, he was too precious. During the years that followed his flight he visited more than 25 countries and participated to numerous receptions, but he wanted only one thing, going back into space. After harsh discussions he obtained the authorisation to flight a MIG-15, but it was the last plane he ever flown. He died at the age of 34 on mars 27, 1968 with his instructor Vladimir Seriogine in strange conditions that are not all known, after his plane become unstable. Since 50 years spaceships and rockets have been improved, and now it is possible to make long duration stay of 6 months and more inside the international space station, where the picture of Gagarin sit enthroned in the command module, which is Russian, but the irony of History wants that the cosmonauts of today still go up in a rocket similar of the Gagarin’s Vostok, the Soyuz. Posted on: 2011-04-12 under Baikonur, Non classé. I can’t forget the anniversary of the first flight of the american space shuttle, the one that triggered the beginning of the Energia-Buran program in 1976. But irony of the delay calendar it lifted off for the first time during the cosmonautic day, on April 12, 1981. The STS program will not last longer than 30 years, it already got an additionnal payment for the last two flights, but there will be no more. This program is half a success or half a failure it depends from what side you see it. Half a success because it allowed the United States to have an autonomous acces to space with a powerful multi-function launcher, a satellite launcher, a space station, and a space truck to bring back loads. Never a spacecraft could have sent into space as many astronauts as the shuttle did, and from so many different nationality. It’s modularity made it the perfect spacecraft to build the international space station and to accomplish a large range of missions. But it is also half a failure because it hasn’t kept his promesses, such as allowing a cheap and reliable access to space. The launches were often delayed or put back because of a breakdown or an anomaly, the reconditioning costs of the boosters and the orbiter never stopped growing for years and unfortunately two accidents sullied its career (the destruction of Challenger during ascent in 1986 and the destruction of Columbia during the return from space in 2003). Now the NASA will have to rely on the rockets of its former rival to send astronauts in the ISS and so until they have a new rocket and spacecraft, 2015 at the earliest ? Of course we can’t forget that the the STS program lasted far longer and done so many things more than it’s Soviet counterpart the Energia-Buran which lasted 16 years (1976-1992/93) with only one maiden flight, but this is other story. Posted on: under Non classé. Near the battlements of the Peter and Paul’s Fortress, of St Petersburg, is located a museum dedicated to the first works of the LenGIRD and then to the space exploration of the USSR. The museum is named after Valentin P. Glushko who was one of the firsts founder’s of the LenGIRD (Group for the Study of Reactive Motion) in 1931. Posted on: 2010-12-27 under Non classé, Museum. There will be, news about space, informations about manned space flights, view of space, interviews, etc. Well, only interesting things. It’s good to know that a new magazine 100% about space is on it’s way to our homes, I missed it !! Unfortunatly, it’s only in French. More informations on the website: espace-exploration.com. Posted on: 2010-12-16 under Non classé. The new edition of the FCS magazine has arrived ! It is a little bit smaller than the number 1 but contains 106 pages where you will be able to read articles about the Apollo program and the Soviet exploration of the Moon through the Lunakhod rovers, there are interviews and also actualities articles notably with the mission on the ISS of Maxim Suraev. You can download it here (in French). Posted on: 2010-04-29 under Non classé, Web Site. It’s with great pleasure that I present you a special book (special because the thematic is rare). This book speaks about a theme that passionate a lot of us, human spaceflights, and especially the flight of a Russian Cosmonaut on-board the MIR space station. Hugo Boris came at Baikonur for his researches and this is where I meet him (my trip to Baikonur). Three years of work… The investigation allowed me to meet many cosmonauts. I went to the star city, at Moscow. But most of all at Baikonur, in Kazakhstan, where I attend a manned launch. This moment was soul-stirring, more than I can imagine. In fact, I can’t get over this trip, I think of it every day. Ivan was chosen to be the first man to stay more than four hundred days in Earth orbit. An ordinary man, married, father of two children, leave the planet. While the soviet empire collapse into chaos, he is revolving endlessly. For him, the Sun rises and sets down sixteen times a day. As time is passing by he is loosing sleep, smell, taste. His vertebral column doesn’t bear him anymore. He has been practicing for many years, the mind entirely pointed toward space. Now, he is only thinking of Earth. He misses Earth like a woman. Posted on: 2010-02-09 under Baikonur, Non classé, Web Site.